Section 1285.110 Continuing Medical Education (CME) a) Continuing Medical Education Hours Requirements 7) The Division, upon recommendation of the Medical Licensing Board, will accept the American Medical Association Physician Recognition Award (AMA PRA) certificate awarded to physicians licensed to practice medicine in all of its branches as documentation of compliance with the 150 CME hours set forth in this Part. The hours shall be earned consistently with the prerenewal period set forth in subsection (a)(2). 20 hours of approved Continuing Education will be required for the June 1, 2014 through May 31, 2016 license renewal cycle. c) Approved CE Sponsors and Programs 1) Sponsor, as used in this Section, shall mean: ​> C) American Nurses Credentialing Center (ANCC) accredited or approved providers. Sec. 16. Expiration, renewal and restoration of licenses. A dentist or dental hygienist shall provide proof of current Basic Life Support (BLS) certification intended for health care providers at the time of renewal as provided by rule. a) Continuing Education Requirements 1) Each person who applies for renewal of a license as a pharmacist shall complete 30 hours of continuing education (CE) during the 24 months preceding the expiration date of the license, in accordance with Section 12 of the Act. b) Approved Continuing Education 1) CE credit shall be based upon the completion of courses offered by providers approved by the Accreditation Council for Pharmacy Education. D) The licensee shall have a current CPR for Healthcare Providers card that covers: i) Adult one-rescuer CPR, ii) Adult foreign body airway obstruction management, iii) Pediatric one-rescuer CPR, iv) Pediatric foreign body airway obstruction management, v) Adult two-rescuer CPR, and vi) AED. 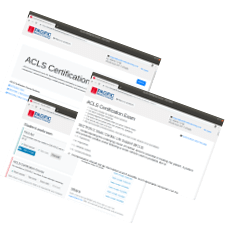 CPR for Healthcare Providers – a course in cardiopulmonary resuscitation that meets or exceeds the American Heart Association course “BLS for Healthcare Providers”. Section 797.1300 Body Artist Proficiency Requirements d) Body artists/apprentices shall maintain documentation of completion of “Bloodborne Pathogen Training”, as required by OSHA (29 CFR 1910.1030) at the body art establishment. Total number of locations: 49. These locations CAN provide American Heart Association-branded provider cards if needed. Two unsuspecting police officers were just finishing looking at a nail salon disturbance, when their radio informed them of an unconscious man in his home. They were nearby so they went to the house immediately. The man was slumped in his chair, clearly in a state of cardiac arrest. His family was pleading them for help. Neither officer had any prior on-field experience when it came to CPR, but their training paid off. They were able to do chest compressions to the man until the arrival of the paramedics. The family was eternally grateful for the heroism of the two officers. A man was pitching to his son in an Oswego sports complex when he suddenly lost consciousness and fell to the ground. People were flocking towards him. A sixteen-year-old girl who was practicing softball with her team immediately volunteered to perform CPR on the man. She was nervous, but she kept her composure and made sure that the man received as much chest compressions as necessary until the emergency responders arrives. The man was taken to the hospital and, after a few struggles with operations and medical procedures, was able to recover well. He thanked the girl and even gave her a necklace with a note saying that she was his guardian angel. Even at the low times of his life, Sammy Tubbs did not forget the skills he learned from being a volunteer firefighter during his younger years. One day in Good Samaritan House, he heard a call for help outside his room. Rushing outside, he recognized the unconscious man lying on the street. The emergency crew took long to arrive, so Tubbs began applying chest compressions to revive him. Luckily, the victim was able to breathe when the paramedics arrived. He was transported to a local hospital and Tubbs went to work as a cleaner. The man is eternally thankful to Tubbs, as well as the Good Samaritan Ministries, since his news segment was used to ask the public for donations to the Christian organization. The Godfrey Fire Protection District acquired a new system Called ResQCPR which is made to specifically improve the compression decompression techniques used in CPR. A 54 year old man was reported to be found unresponsive and the personnel was dispatched to quickly attend the call, after arriving they tested the ResQCPR by placing the machine on the patient’s chest. A Defibrillator was also used and after a second shock the patient regained a pulse and started breathing, proving that the system really works and improves the life expectancy of individuals suffering from cardiac arrest and needing CPR.